It costs a pretty penny by the OC10 offers a simple solution for those keen to use a switcher. Pedal-switching systems can make a lot of sense in many ways for multiple pedal setups. For starters, all of your footswitches can be lined up conveniently close to each other in a row at the same height; you can set up a loop to turn two or more pedals on at once with one footswitch; and you can keep certain pedals out of the chain so they don't contribute to signal degradation when bypassed. 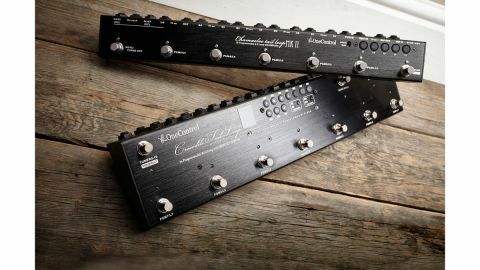 One Control is a Japanese company specialising in pedal-switching hardware and the Crocodile Tail Loop OC10 is its flagship switcher. The OC10 offers 10 footswitchable loops, which you can connect to single or multiple pedals and can be used in 'Direct' mode. Here, each footswitch accesses the pedals in its related loop or can be programmed so that footswitches bring in a preset combination of loops. There are 70 onboard presets in 10 banks of seven - two upper footswitches scroll through the banks, while the lower seven footswitches call up the programs in the selected bank. Setting up the presets is an easy process using 10 low-profile buttons - one for each loop - that can be toggled on and off to make a loop active in that preset. While all of the loops are true bypass, there is buffering in the system that can be patched in at the start of the chain or further along. Loop connectivity is also flexible, with seven loops that connect serially internally, and three that need tobe patched in, so that they can be used serially with the seven, connected to an amp's effects loop or even set up as amp- channel switchers. For users willing to embrace higher tech methods, the OC10 is equipped with MIDI and can send program change messages to pedals that support it. It can also be connected via a LAN cable to another OC10 to allow access to multiple pedals offstage. The switcher has workable footprint and could easily slot into a small pedalboard. The OC10 obviously offers a lot, but at the asking price we'd be inclined to wait careful comparison with the Boss ES-8 would be wise: while it only has eight loops, it has the ability to change the order of the loops in a preset and to set up parallel loops. Of course, some players may see the idea of employing a pedal switcher as a complication too far, but if you like the idea, we have to say that the operational simplicity of the One Control units is a massive plus point in their favour.